March 2017 saw the visit to the UK of two doctors tasked by the Ministry of Health in Myanmar with developing services for those with deafness in their country. 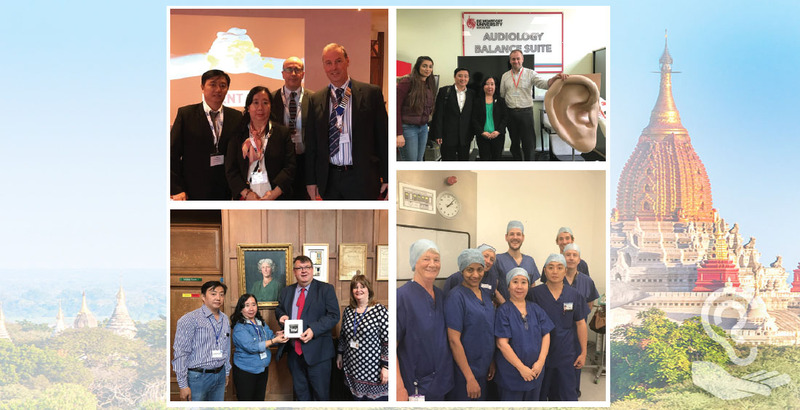 Prof Khin Hla Hla and Dr Tin Maung Win spent two weeks on a busy tour of centres involved with hearing diagnosis, treatment and education. They travelled as guests of The Royal College of Surgeons of England and ENTUK. The visit was coordinated by Robin Youngs, currently the lead for Global Health for ENTUK. Their visit was slightly delayed by visa formalities and they arrived at Heathrow at 6am on a cold Wednesday morning. They were whisked away to Gloucestershire Royal Hospital where they spent two days interacting with the ENT and audiology teams, with particular focus on paediatric hearing testing, neonatal screening, vestibular testing and endoscopic ear surgery. London was their next port of call where they visited the International Office of The Royal College of Surgeons of England. They then spent three days at the De Montfort University School of Audiology, where they were hosted by Rob Frost. They were able to visit the Leicester Balance Unit and the Nottingham Cochlear Implant Programme and then travelled to York where they were guests of honour at the ENTUK Spring Meeting. Their final port of call was Newbury where they spent a day with Viv Ogg at Mary Hare School for the Deaf. This initiative is part of an ongoing partnership between ENT teams in Myanmar and the UK established by Robin Youngs and Nick Stafford in 2002. A main goal is to reduce the burden of disability in children with deafness in Myanmar. A 1997 WHO survey estimated that 8% or about 4 million people in Myanmar suffered with significant deafness according to WHO criteria. The infrastructure for those with deafness is quite limited in Myanmar and there is an acute shortage of trained audiology staff with up until recently, only a single state employed audiologist for the whole country of 60 million people. Availability of hearing aids is confined to a small number of private commercial dispensers working mainly in the large cities. In parallel with the ENT partnership has been the establishment of The Mandalay School for the Deaf Charity in the UK. This NGO has a fascinating history having been established by David Blakeway Smith in 2015. David and his wife, Sandra travelled to Mandalay in 1962 and worked as teachers. Sandra was a qualified Teacher of the Deaf and, from scratch, started a School for the Deaf in Mandalay. However, after a military coup they were expelled from Myanmar in 1964 but by that time the school had 27 children attending. The country was then ‘closed’ and they lost contact. Sandra passed away in 2013 and David decided to find out what had become of the school. His detective work revealed that the school that Sandra had started had been taken on by the Myanmar Government and now had over 200 pupils. Inspired by this, David established the Mandalay School for the Deaf Charity with the help of Robin Youngs. At the invitation of The Ministry of Social Welfare in Myanmar, the charity provides support to the Government Schools for the Deaf in both Mandalay and Yangon. David Blakeway Smith sadly passed away suddenly in 2016; the Trustees of the charity are determined to continue David’s work and will be working with the ‘Hear the World’ Foundation over the next few years to this end. © 2019 Mandalay School For The Deaf - All Rights Reserved.